The Rotary Club of Bungendore is an organisation of people united to provide humanitarian service, encourage high ethical standards in all vocations, and help build goodwill and peace. The Object of Rotary is to encourage and foster the ideal of service as a basis of worthy enterprise. The Rotary Club of Bungendore was chartered in 2003. The club serves its local community by supporting community events such as the Queanbeyan-Palerang Regional Council’s Australia Day Celebration by providing the famous Rotary BBQ and catering service. The Rotary BBQ also raises funds by catering at other events such as the Queanbeyan 4Wheel Drive Show and the Bungendore and District Car Club show. The Club is very involved in helping local youth reach their full potential by sponsoring them to participate in such programs as: Rotary Youth Leadership Award (RYLA), Rotary Youth Program of Enrichment (RYPEN), National Youth Science Forum (NYSF),Youth Exchange. The Club runs a Public Speaking Competition for primary school students and awards book prizes to primary schools for excellence in literacy. Internationally the Club supports the eradication of Polio; the Rotary Australia World Community Service (RAWCs program); disaster relief by supplying Shelterboxes; as well as by supporting Interplast where teams of doctors and nurses are sent overseas to train medical staff. 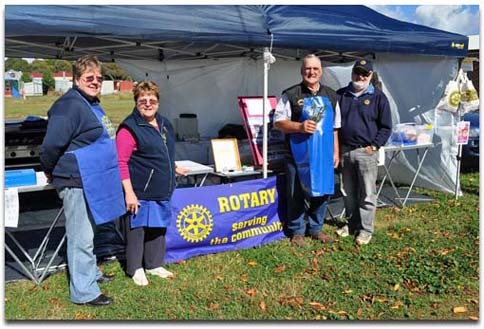 The Rotary Club also provides local community support by taking part in activities such as Bungendore Show Parking. The Rotary Club of Bungendore meets every Tuesday night at 7:00 pm for fellowship and a meal in Bungendore. Are you interested in becoming involved in your community? Do you want to meet like-minded people? Do you want to give back to your community?